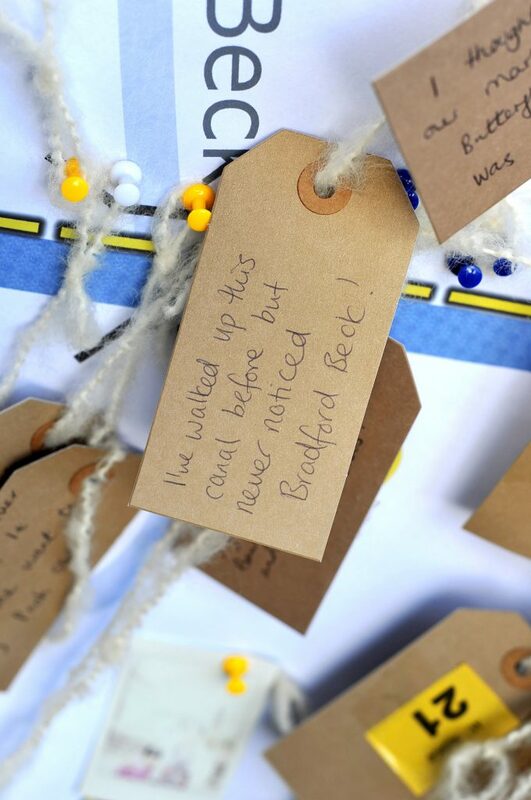 Seven Bridges was a participatory promenade tour along the Leeds-Liverpool Canal in Shipley. 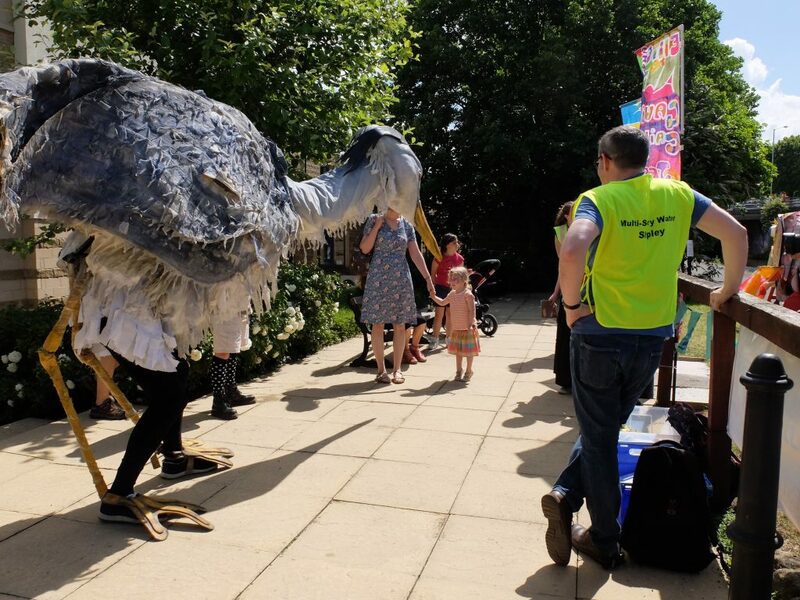 It was developed by Multi-Story Water as our key contribution to the Shipley Street Arts Festival of 2015 — and ran on the same weekend as another piece we made with the same title at Leeds Waterfront Festival. 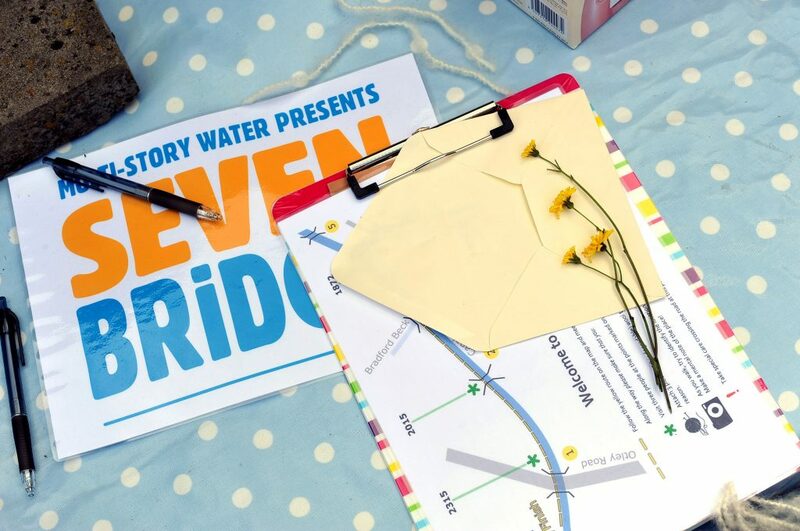 These two versions of Seven Bridges provided a conceptual “bridge” between the two Aire valley festivals, 12 miles apart. A blog account of these events is offered here, and MSW’s other contributions to the Street Arts Festival are documented here. 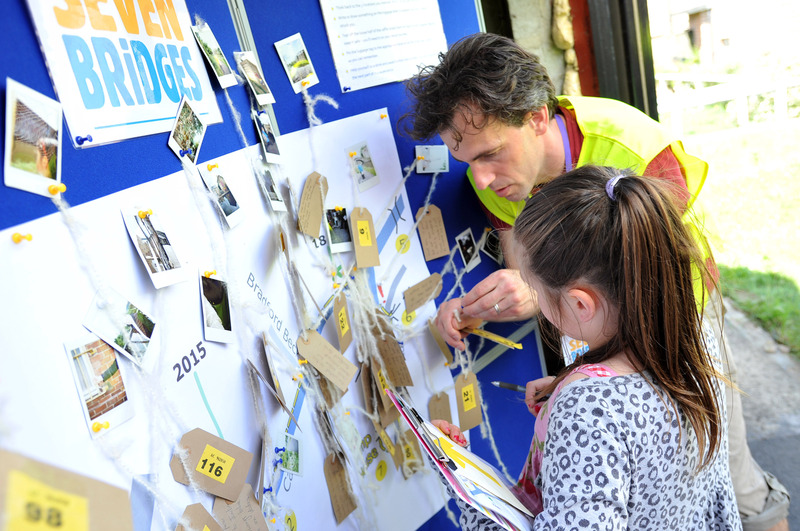 Participants could arrive to undertake the Seven Bridges walk at any time between 11.30 and 2.30pm (peak festival hours), since the experience was repeated at regular intervals. Walkers were assembled into groups of five or six, and provided with clipboards bearing: (1) a simple, schematic map of an eastward route along the canal, and (2) an envelope containing a polaroid-style photograph and three lengths of coarse, biodegradable wool (a nod to Shipley’s history of textile manufacturing). 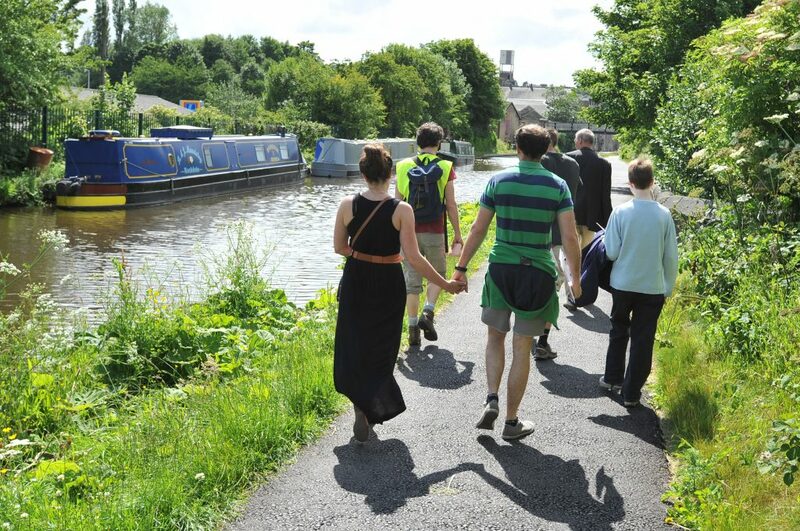 Walking: to self-guide themselves, as a group, along the marked route, via seven bridges. Knotting: to attach the pieces of wool to any three locations along the way that “resonate with you for some reason”. 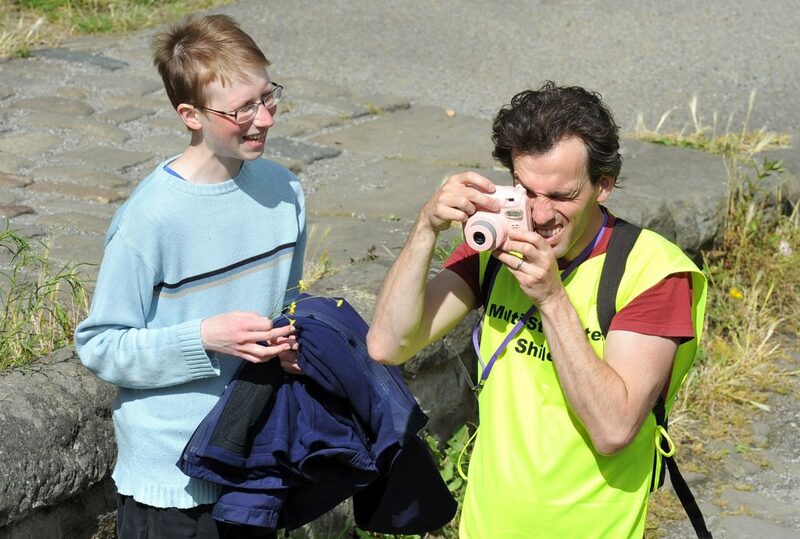 Spotting: to try to identify, along the route, the location where the enclosed photograph was taken by a previous audience member. 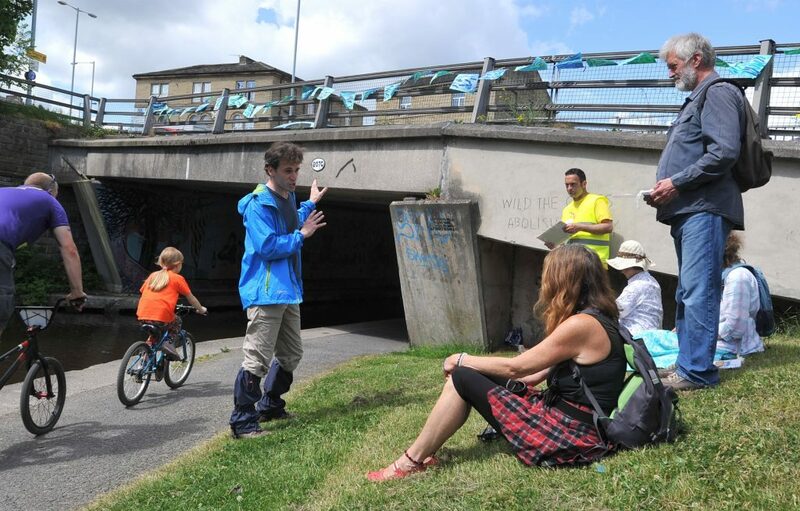 Armed with these materials, participants set off along the towpath, heading almost immediatedly underneath the first of our seven bridges (the ugly concrete construction that carries the multi-carriageway Otley Road across the canal) and past the decades-old, psychedelic mural on the facing wall. 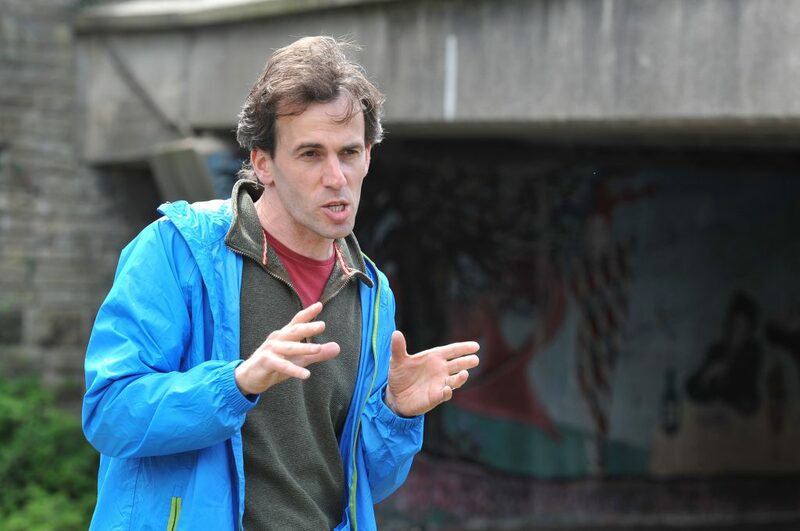 On emerging from under the bridge, they encountered the first of our actors, David Smith… whose greeting and monologue quickly made it apparent that he was “in the future” — 2315 to be exact. “Welcome. 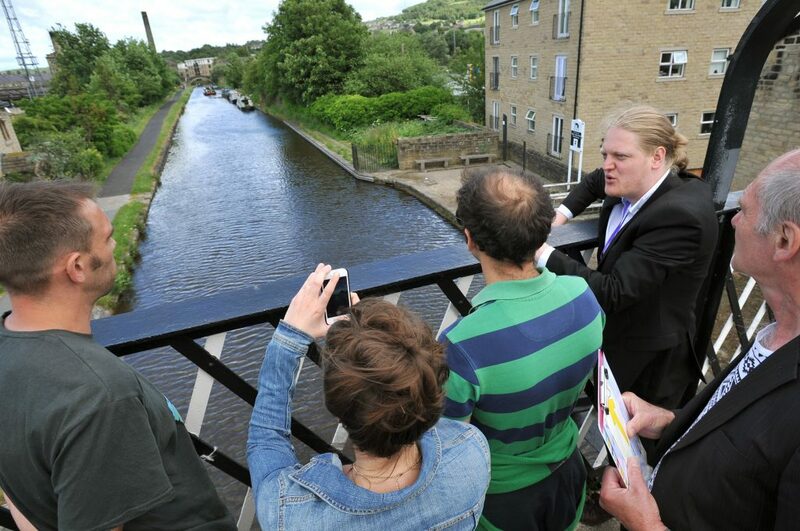 Next weekend the Shipley Canal Heritage site opens to the public, and it’s a pleasure to unveil it to you – our principal funders – today. 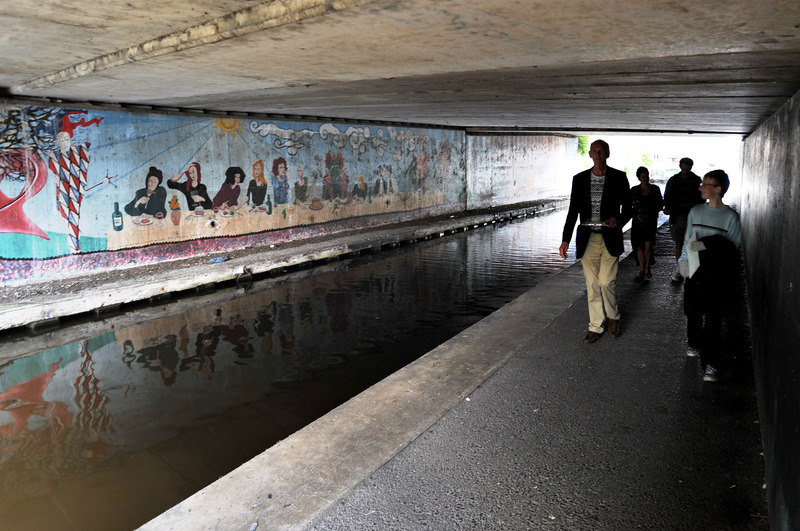 This is the only surviving section of the once-popular Leeds-Liverpool Canal – and we’ve restored it to how it would have appeared 300 yrs ago, in 2015. This structure is one of the major heritage points along the route – so visitors get a rich experience from the off. “The noise you hear is – we believe – a faithful reproduction of what you would have heard here in 2015, and is produced by “cars” — the motorised units crossing this “bridge”, which, like much in this environment, is man-made. Cars were the primary mode of transport prior to the advent of affordable teleportation – the noise due to fossil-fuel based combustion engines, which would no longer be legal. These simulations are silent, with the soundscape piped in through concealed speakers. 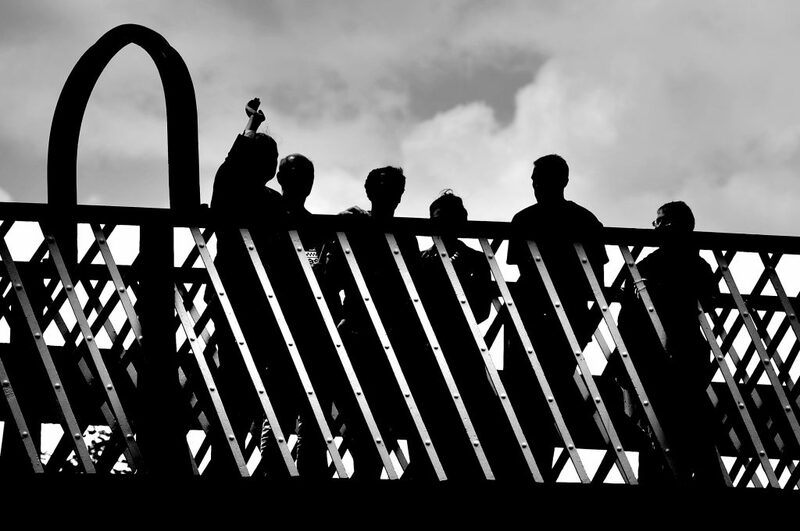 “We don’t know what the bridge’s official name was, so we call it ‘Arts Bridge’ – reflecting the rich variety of art from multiple disciplines. Here (indicates) is a form of graffiti known as tagging – a rudimentary artform, but clearly important, as archaeological research clearly shows that it was widespread in public locations. “This piece – STOP MORRISONS KILLING RARE MARBLED WHITE BUTTERFLY seems to have a political motivation, but we’ve yet to uncover who or what ‘Morrisons’ was and why they had taken against the butterfly: research continues. . . Here: WILD THE CITIES ABOLISH MONEY seems to relate directly to the bridge structure. Ironically, we have gone to great lengths to recreate the road, as so few have survived – this was a stretch of scrubland before we got to work on it. From here, walkers continued east along the canal… as they meandered, they tied pieces of wool to everything from bars across a window to canalside weeds plants… until encountering a second performer, Simon Brewis, underneath our second bridge, the early Victorian Gallows Bridge (so-named for its right-angled cross-frame). 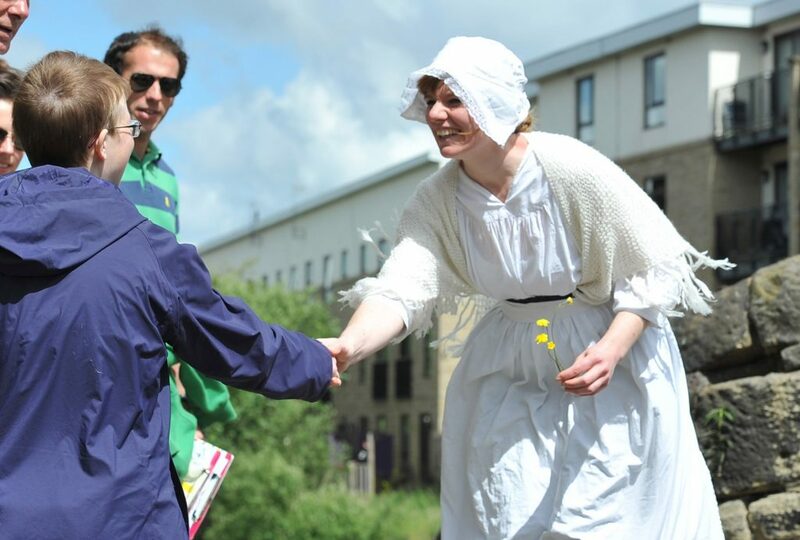 At Junction Bridge, walkers are greeted by our third performer, Lynsey Jones. It is quickly evident from her costume and speech that she is in the past — 1872 to be precise. 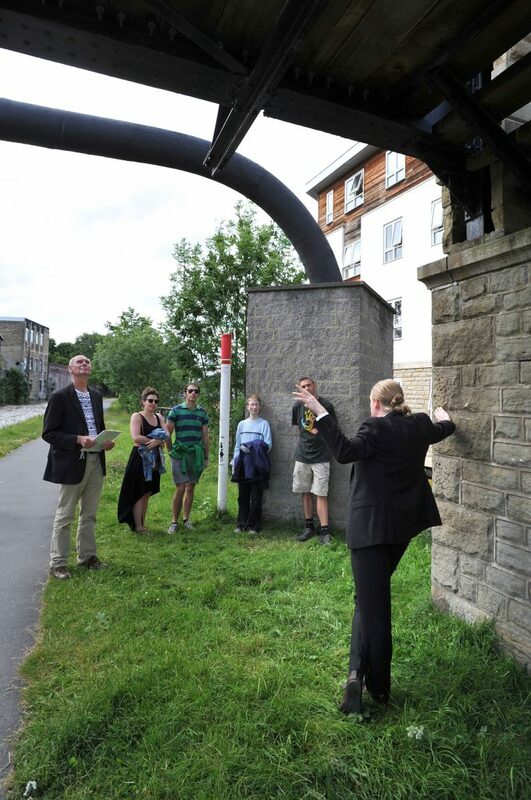 She is, she explains, the wife of the lock-keeper for Lock 1 of the Bradford Canal. Their cottage is just a few yards up the road on Dock Lane, because the junction for which Junction Bridge is named is the point at which the Bradford Canal joins the Leeds-to-Liverpool Canal. The bridge was built at the same time as the canals themselves, in the early 1770s, for horses to cross from one towpath to the other. Did you find the location of your photo along the way…? Please pin the photo around the edge of the map, using the wool attached to the tag to connect it with its location. Take a blank luggage tag from the table. Think back to the 3 locations you marked. Which struck you the most? Write or draw something on the luggage label to express how the location struck you. 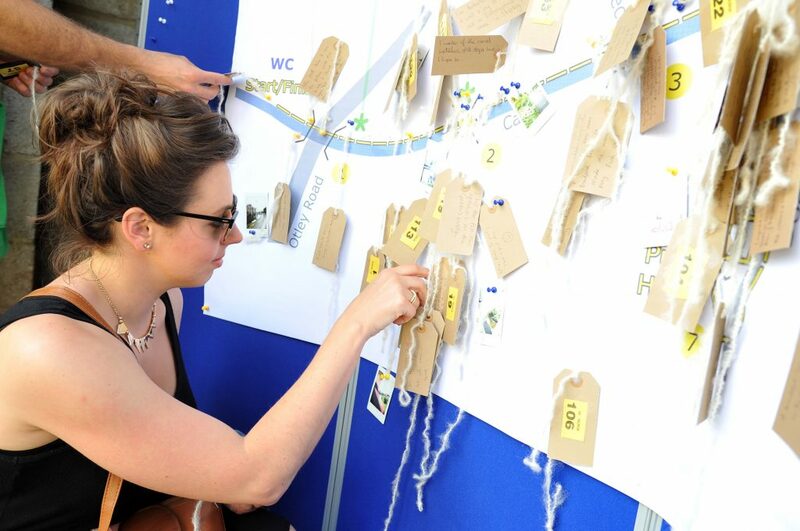 Pin the luggage tag to the appropriate location on the large map, as accurately as you can remember. Help yourself to a drink and await further instructions – you will be gathered for the next part of the experience. 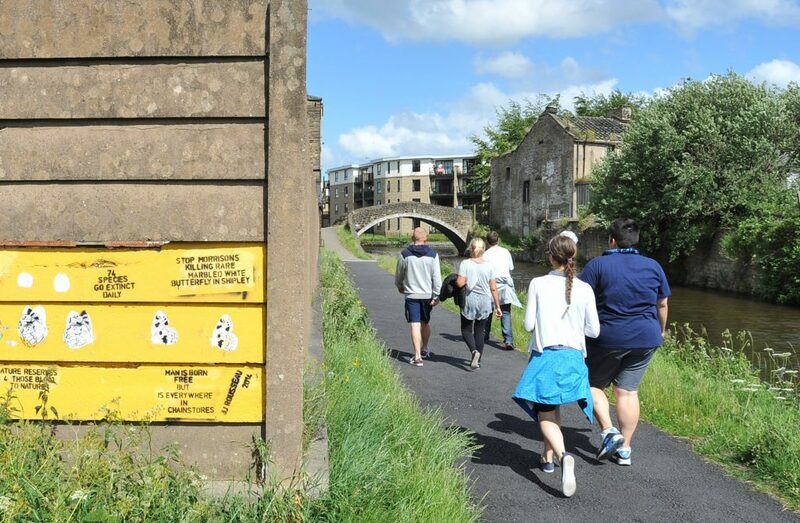 From this pumphouse hub, participants were now “recycled” back along the route they had already walked, to their starting point at Shipley Wharf (we thought of the journey as a kind of palindrome – there and back). On the return journey, they were accompanied by the performers — no longer in character — who each carried a Fujifilm camera, handing it out as necessary so that each participant could take a single exposure. The picture they chose was of their personal favourite location from the three they had earlier wool-tagged… and these were then used in the envelopes given to the subsequent participants at the start of their walks. And so we retrace our steps, looking at the same scene in reverse — pausing to discuss the spots we chose to tag, and why, and sharing our thoughts and memories about the land- and waterscape around us… The actors are out of character now, unscripted, just conversing as we walk — but with certain gentle prompts for conversation so that there’s no danger of things ‘drying up’… It’s a period of sharing and reflecting in the sunshine. and research/dramaturgical input from Steve Bottoms. Flyer and logos designed by John Polley. With special thanks to Natasha Glew and Q20 Theatre. 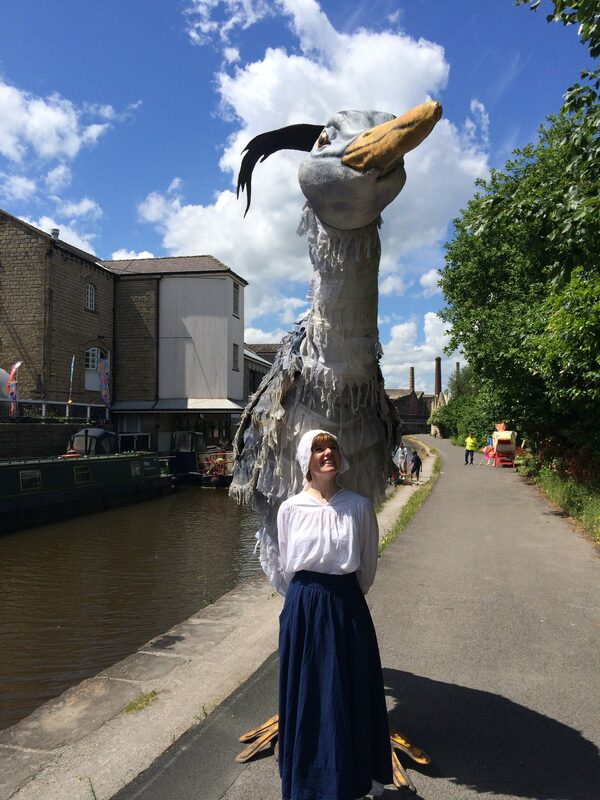 Lynsey Jones poses with the Q20 stork between performances at Shipley Wharf. 2. Gallows Bridge. The current iron and stone structure dates from the first half of the 19th Century, as do the stone cottages and former textile workshops on the south bank. However, there appears to have been a bridge at this location ever since the canal was built in 1774. The little landing platform, Gallows Wharf, used to be a stop for the local waterbus. 3. Canal aqueduct. The Leeds-Liverpool Canal here passes effortlessly across the Bradford Beck. The Beck is made up from the water of many smaller becks that come together around Bradford, and flows into the River Aire just yards downstream from here. It is walled away because, in the past, it was treated as little more than an open sewage drain. 4. Junction Bridge. One of the oldest bridges on the Leeds-Liverpool Canal, this stone-built structure dates back to 1774, and permitted tow-horses to pass across to the towpath of the Bradford Canal, which opened around the same time. The earliest cargoes on the Leeds-Liverpool were those moving between Skipton and Bradford, via this junction here. 5. Dock Lane Swing Bridge. The relatively modern structure replaced an earlier swing bridge at this spot. Boaters need a crank handle to open it, and must turn it 18 times to fully open and close the bridge. Dock Lane is so-called because there used to be a dry dock for barges southwest of the bridge. 6. Railway bridge over Dock Lane. This bridge carries the Aire Valley line from Leeds to Skipton (though another line forks off to Bradford, just above the Beck by McDonalds). 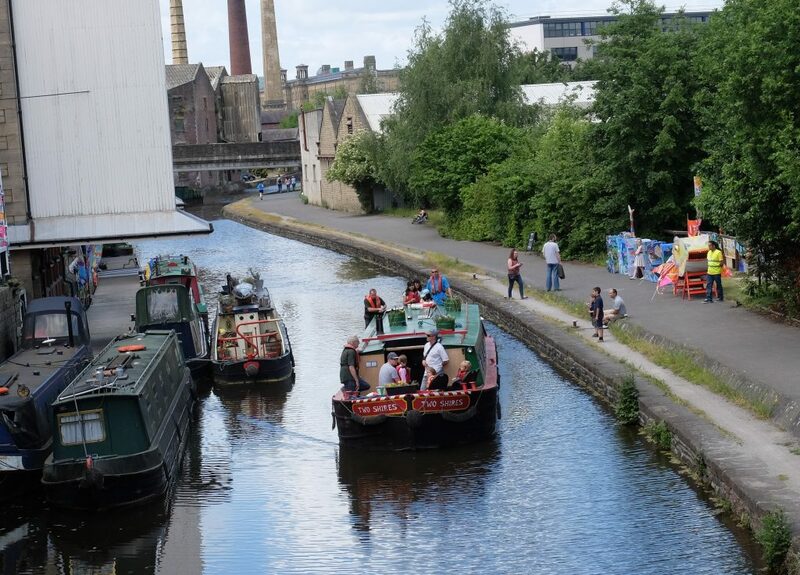 From the mid-19th Century on, railways began to replace canals as the principal method for hauling industrial freight, although the Leeds-Liverpool Canal Company remained profitable well into the twentieth century. 7. Pumphouse garden bridge. You can still see the outline here of the former lock chamber – Lock 1 of 10 on the three miles of the Bradford Canal. However, the white railings of the ‘bridge’ here are entirely fake, a garden ornament put in by the former owners who turned the pumphouse into a residence. 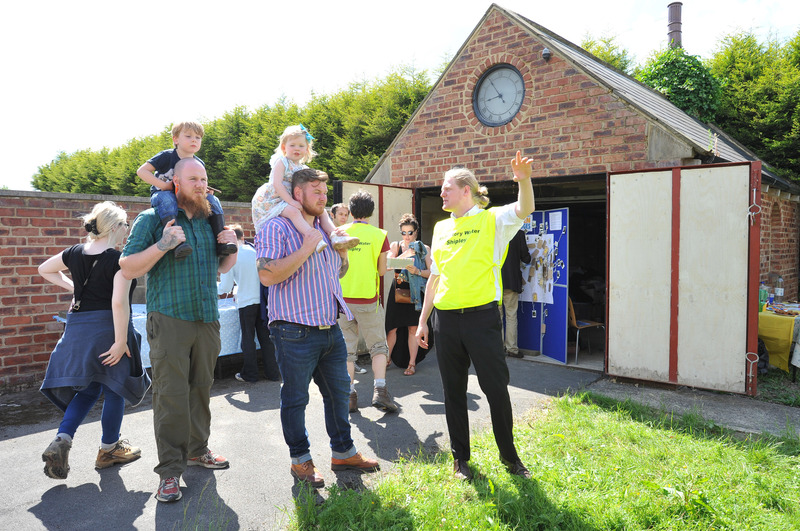 The pumphouse is currently owned by Bradford Council, who kindly granted us access.